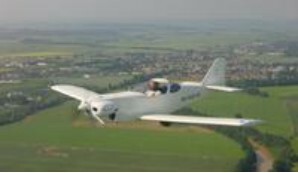 Single seat european ultralight with fully retractable landing gear. Fuselage is welded steel spaceframe construction covered by ceconite. Between the firewall and instrument panel is allmost 8 U.S. gal. composite fuel tank. The central section contains gear reinforcement areas for main landing gear and all retractable mechanism that is placed uder the seat. The wing is of single spar contruction build of glass-epoxy composite with carbon fibre main spars, wing skins molded in negative molds. Wing enploys split flap that increase speed range. Wings can be easy removed by one person. Tail section: Centilever tail is constructed with tube aluminium spars and styrofoam ribs covered by ceconite. Horizontal tail section is easy removable. New model of B612 is delivered with all composite tail section only. Lending gear: Welded steel udercarriage legs with hydraulic-shock-absorber are manually retractable. The tricycle gear configuration, steerable nosewheel and diferential braking all combine to make the aircraft easy handle on the ground. Engine: accetable hp range is 28- 80 hp and the B-612 is originaly designed for Rotax 503 [50hp].